The dublin shape name seems to appear with every other straight shape at the dawn of briar history in the last decades of the 19th century. The name suggests its origins, and you might think it has something to do with the dudeen or clay pipe of Dublin. No, and yes. No: dudeen, also spelled dudheen, doodeen, and doodheen, is from the Irish Gaelic dūidīn, and is the diminutive of dūd, “pipe,” so that a dudeen is “a short tobacco pipe made of clay,” according to the Webster’s Third New International Dictionary, Unabridged. And “Dublin,” of course, is from the Irish dubhlinn (dubh = black and linn = pool). The dublin shape is common among clays, but not specific to the town of Dublin. 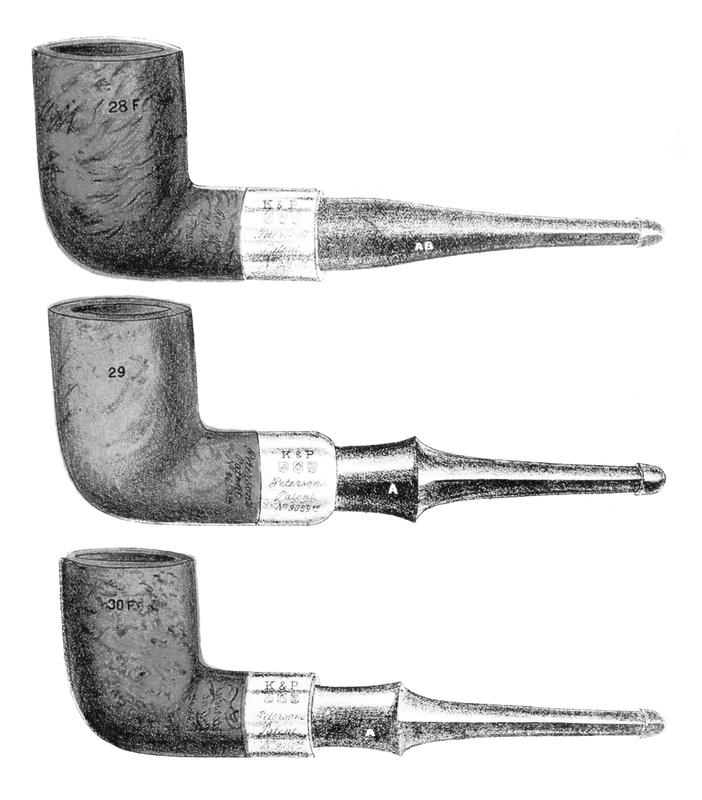 Yes: Somehow, quite early in the history of briar pipes, the shape name came to be associated with the town bearing its name.It doesn’t really matter, I suppose, whether it was a name used in an early pipe catalog or a name like the “dutch” billiard coined by servicemen. And if any pipe maker might be said to have proprietary rights to the shape, I’d say it would have to be an Irish maker, wouldn’t you? The Peterson book, incidentally, has some history about the Dublin clay pipe industry in the late 19th century as well as K&P’s own clay System pipes. It’s significant, I think, that Peterson’s very first catalog contained the shape, if not the name. 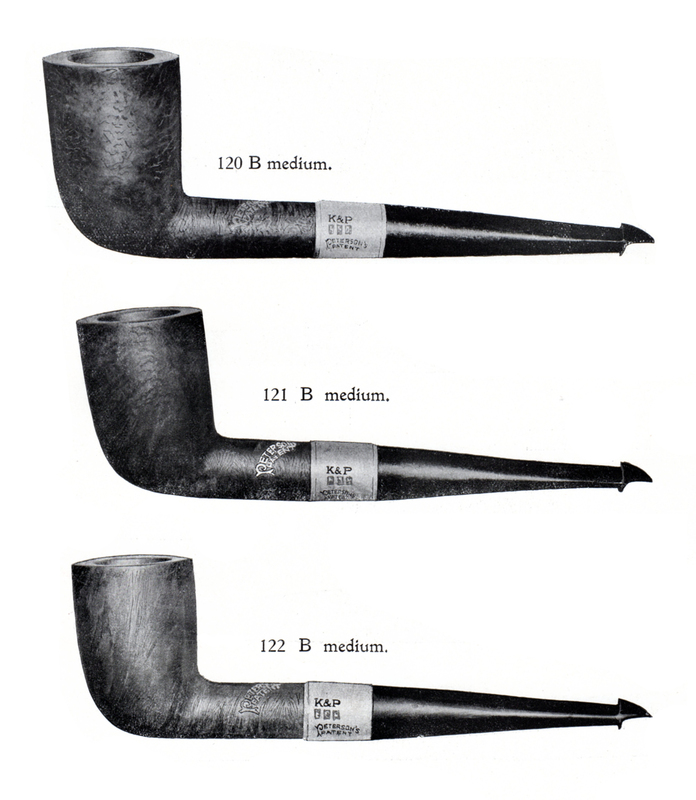 Remember that over the years, Peterson has only rarely added names to their shape numbers, although a few shapes have only had names. It’s also important to understand that Peterson has only attempted a comprehensive catalog of all the shapes in production five times in their long history (1896, 1906, 1947 and 1975/79), and even then omitted some shapes that were produced in such small quantities as to not warrant the printer’s ink. On the other hand, there is every reason to believe that there are a number of shapes that have begun production and then been in the catalog for decades, sometimes since the company’s beginning. What follows is as comprehensive a visual catalog of Peterson’s dublin shapes as I’m able to present based on the literature at my disposal and the generally poor condition of what Poirot calls my “little gray cells.” This post surveys only the straight dublins, although I would like to document the heeled and bent dublins sometime in the near future. Straight Systems are fascinating pipes, and if you ever get a chance to smoke one, try it. I believe the 120 System re-entered the catalog quite briefly twice, once in the 1950s and then again in the late 1970s. They have three characteristics: they’re very dry; they have shallow bowls (as you can see in the demonstrator photo below), and they ghost easily, much as the current reverse calabashes, and so require care if not devoted to a single type of tobacco or blend. By the 1906 catalog, Patent System dublins are represented in only two sizes, shapes 31 and 32. As the 1896 and 1906 catalogs were printed at full scale, by laying a transparency of the 1906 shapes over the 1896, it appears that the 1896 shape 30 is closest in size to the 1906—identical, it looks to me. And the 1906 shape 32 is smaller than the 31, making it the smallest, with the 1896 large shape, the 28, having been discarded. 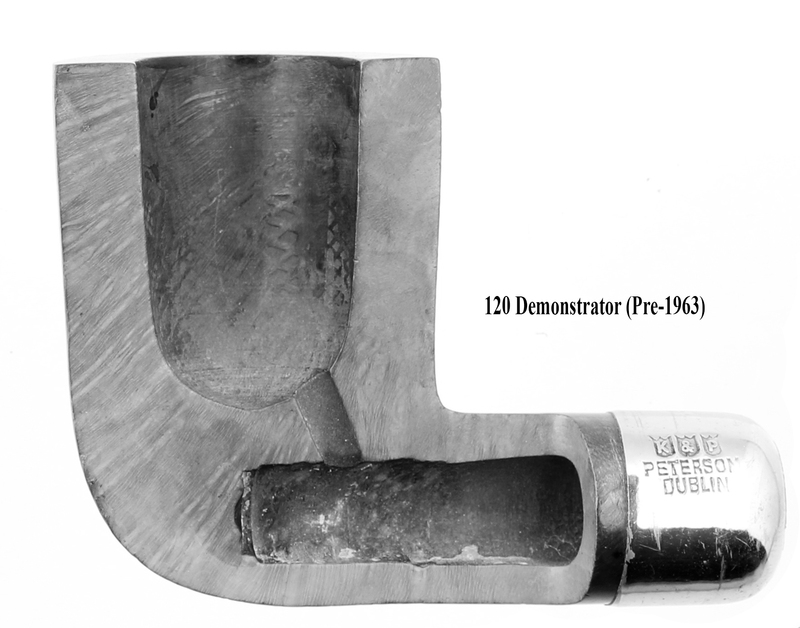 Far more important for later generations of smokers was the introduction of the Patent Lip dublin shapes, which with their traditional drilling at the side of the chamber’s floor allow for a conventional chamber size. The largest of the three, the 120, has been in production now for 112 years, but the 121 and 122 were both seen well into the mid-twentieth century. The IFS-Era added two new straight dublins to the 120, 121, and 122: the 120F (“Flat” or oval shank) and slender 417. The System straights seem to have disappeared by this time. The 120F is a natural thought in Peterson’s design language, which always comes back to comfort and practicality, and I can imagine someone in bowl-turning or even a customer thinking how great it would be to set his straight dublin down in order to emphasize a point over a pint. The first illustration of the 120F seems to be in the1937 “A Chat with the Smoker” pipe-box brochure issued not longer after Peterson opened their London factory. (It may well have been in production before then.) Examples of the shape appear as late as the 1965 catalog and may well have been made for several years after that. 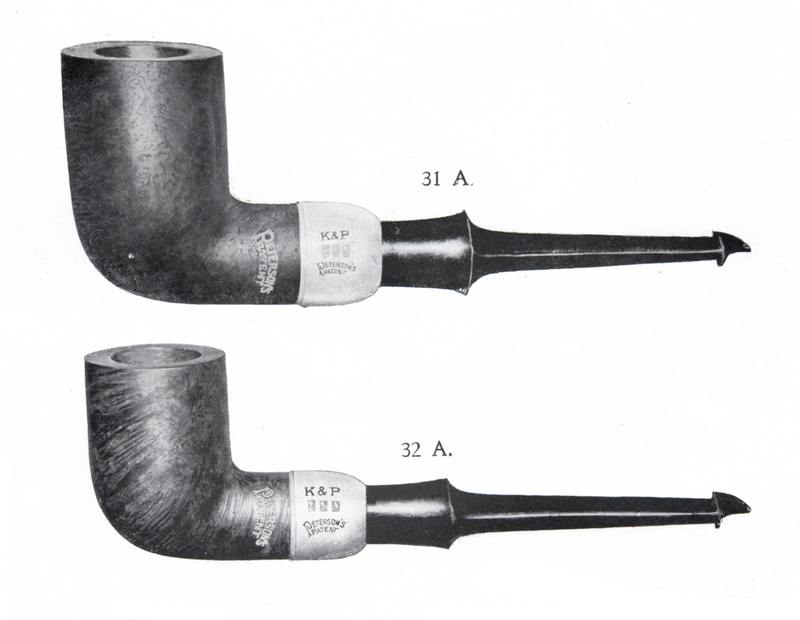 The 417, a small-bowled Dublin with a “bing”-length shank, first appeared in the 1937 catalog, but with two shape numbers: 417 for the Kapet and DeLuxe and 2022 for the “K” and 1st quality. The 2022 number would be dropped by 1945. Like the 120F, the last sighting of the 417 was in the 1965 catalog. The Éire Era produced two new dublin shapes. The first was a rarely-seen and gorgeous 935, illustrated here in the US-only Shamrock version created for Rogers Imports, Ltd. The 900 shape numbers are seen only in the 1937 catalog and a tantalizing chart in the 1942 George Yale catalog. As you can see from the average measurements (given at the bottom of this post), the 935 is smaller than the 120. The other Éire dublin came at the end of the era in the 1947 shape chart as part of “SPORTS” line’s shape 8, a pocket-pipe version of the 120. This line was created using used popular bowls, then shortening the shanks and mounting them with tiny P-Lips (aside from the original bulldog shape 5). 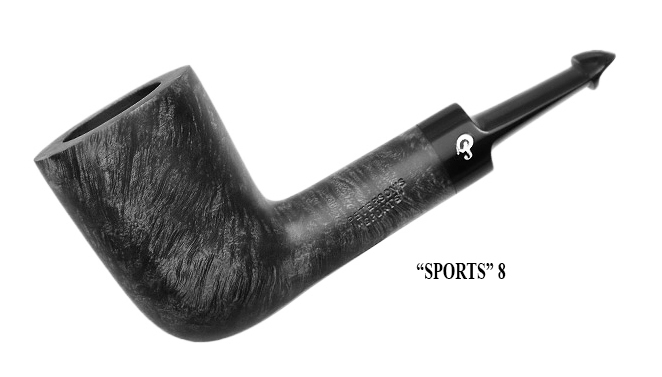 Italian smokers continued to order the “SPORTS” pipes well into the early 21st century and they are still sometimes available in the US. Tom Palmer’s Dublin era saw no less than four new dublin shapes as well as a bell dublin and a handful of bent dublins. It is significant that these shapes followed 1988’s Millennium with its almost futuristic or Italian sensibility yet began with the 1995 shape A4 dublin Antique Reproduction. In hindsight, I think Peterson was making a de facto statement about the importance of the dublin shape to its catalog. 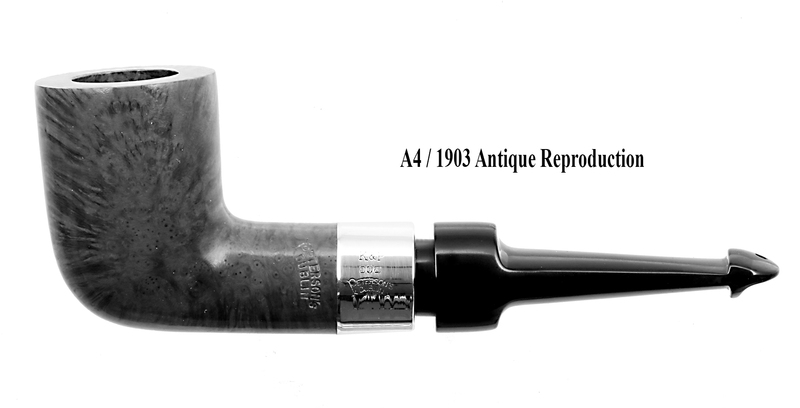 The A4 is one of my favorites in Peterson’s dublin group, originally issued as the 1903 Antique Reproduction in the quartet of four shapes from 1995. It was doubtless inspired by an engraving with just this mounting from the 1906 catalog (which you’ll see in the Peterson book). Peterson’s reproductions are hit-and-miss, sometimes being homages rather than strictly authentic re-creations, sometimes being somewhere in between, and once in a while hitting the target dead center. As a reproduction, the A4 is a fascinating, even remarkable piece. Folk unfamiliar with Peterson history might easily enough mistake it for the real deal. The thick shank makes it an obvious homage to the shape 31 Patent System seen above [not to be confused with the current-production System 31]. And it scores perfect marks for the high-fidelity S (saddle) Patent-Lip System mouthpiece with its graduated bore and build-in (rather than screw-in) extended tenon seen on mid- and lower-grade Patent Systems. But it’s not a System pipe. Instead, Peterson designed it as what we call in the book a type of “sub-System”—a long-standing Peterson design concept—the graduated bore P-Lip mouthpiece will keep a straight pipe’s air hole much drier, but by forgoing the reservoir, allow for a deeper chamber (20mm x 42mm). And that, in my opinion, is all to the good. 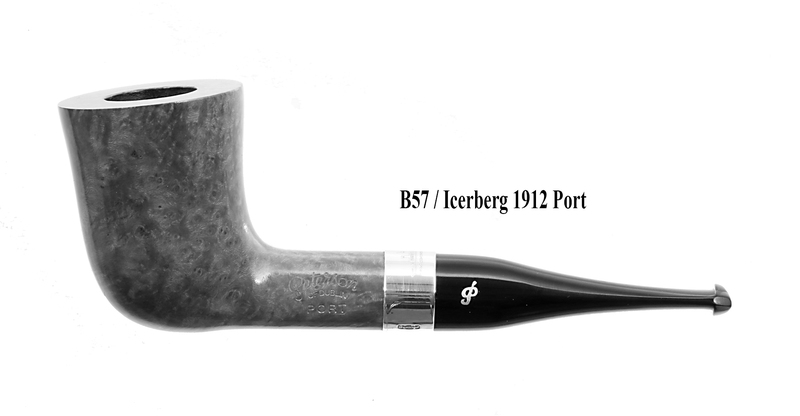 The B16 is the Big One in Peterson’s shape group, the largest of all production dublins, and appropriately so as it honors Tom Crean, the “Irish Giant” who was pictured several times smoking a Peterson dublin. The B16 was issued as part of my all-time favorite Dublin era special collection, the Great Explorers, which came out in 2002. 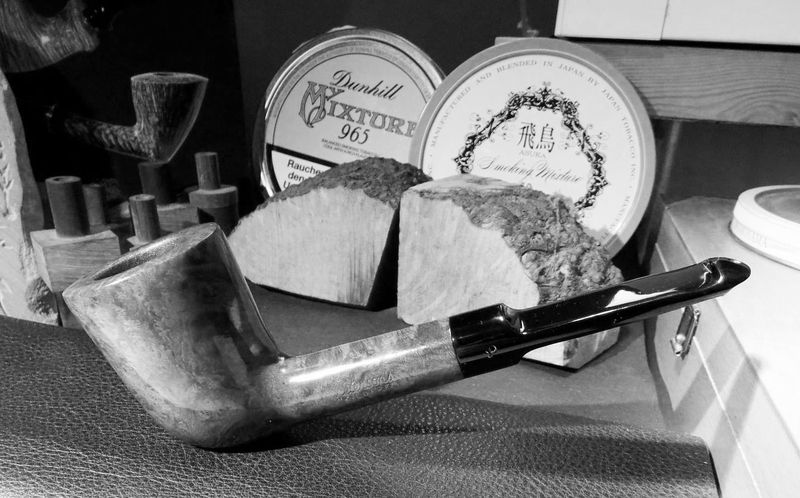 In 2010, Peterson released its most visually extreme straight dublin shape, the aptly named ‘Wilde’ or B47 from the Writers Collection quartet. The narrow waistline of the bow and cant of the rim gives the shape the quasi-optical illusion of a dublin bell, accentuated by the slightly downturned mouthpiece. It’s still a straight dublin, but it has become much more fluid. Peterson has always been a bit secretive about who designed what shape. Apart from Charles Peterson’s originals in the 1896 and 1906 catalogs and several Paddy Larrigan originals, only a few shapes can be traced to specific designers, as you’ll see in the Peterson book. But whoever designed the Titanic centenary collection, released as the Iceberg 1912 quartet, did a remarkable job evoking a maritime feeling. The B57 / Port takes the classic dublin shape and cinches it slightly at the waist. It is almost (but not quite) the same shape as the B47, being a little thicker around the waist and with a straight mouthpiece. Shape 120 Patent Lip Straight Dublin. Years of production: 1906 – present. Bowl Height: 1.94 in./49.28 mm. Outside Diameter: 1.38 in./35.05 mm. Shape 122 Patent Lip Straight Dublin. Length: 5.5 in. / 139.7 mm. Weight: .095 oz. / 27.7 g.
Bowl Height: 1.78 in. / 45.29 mm. Chamber Depth: 1.527 in. / 38.80 mm. Chamber Diameter: 0.734 in. / 18.65 mm. Outside Diameter: 1.226 in. / 31.15 mm. Shape 120F (flat shank) P-Lip Straight Dublin. Outside Diameter: 1.24 in./31.50 mm. Weight: 1.40 oz. / 40 gr. Bowl Height: 1.75 in. / 44.45 mm. Chamber Depth: 1.375 in. / 34.925 mm. Chamber Diameter: 0.75 in. /19.05 mm. Outside Diameter: 1.325 in./ 33.65 mm. ** Joe’s opinion was confirmed by Doris Barrett in shipping and Tony Whelan, Jr., retired factory director. Email to Mark Irwin, 24 October 2018. Out of bed to coffee and good reading. I am smoking the 988-1988 dublin these days and perhaps the 1903 tomorrow. I am covered with one 988 and three 1903 in unsmoked stock. Cole is always good reading. Thank you Mark. Jorgen, just to make this clear in my mind: do you run a Peterson pipe shop? Or are you just the world’s biggest collector? If the former, we need to talk business. If the latter, I hear psychiatric care is affordable in your part of the world. LOL. Absolutely fascinating. Beautiful models and the Dublin is such an elegant shape. I am also thoroughly impressed by the amount of research you have undertaken and the knowledge you impart. Thank you for a very interesting read as I munch my toast and sip my coffee on a cold and grey morning here in the UK. My pleasure, Steven. We have clear skies here in Texas for the first time in over 2 weeks, although we’re still getting “areal flooding” (puddle) warnings. Hi just wondering if you know anything about Peterson special line? Hi, the “Special” stamp is not a line, but an indication that the pipe is either a one-off (custom order), or from a special group of pipes. One-offs sometimes do not have stamp numbers (like the 69) but are unusual in finish or adornment and often made by request. Sometimes Peterson will experiment with a stain or finish and make a small group of pipes for the market and add the SPECIAL stamp. Not always, but usually “Special” pipes feature very good wood. That definitely made for a great read on a rainy, Saturday morning. My whole body had pruned from all the rain we’ve had. Hope yours clears up soon, and glad you enjoyed it. Another great blog post Mark, thank you! As to the lack of a shape nummer on the 988 – 1988 millennium issue i have tot diagree. There is a pipe on eBay at the moment wich is probably a millennium reject stamped xl88. See the link below for pictures. Superb! Thanks, Jim. This is really cool. XL88S, indeed. I just nabbed the photos from ebay. The specs check out. Thanks so much for this. I will edit the post accordingly. 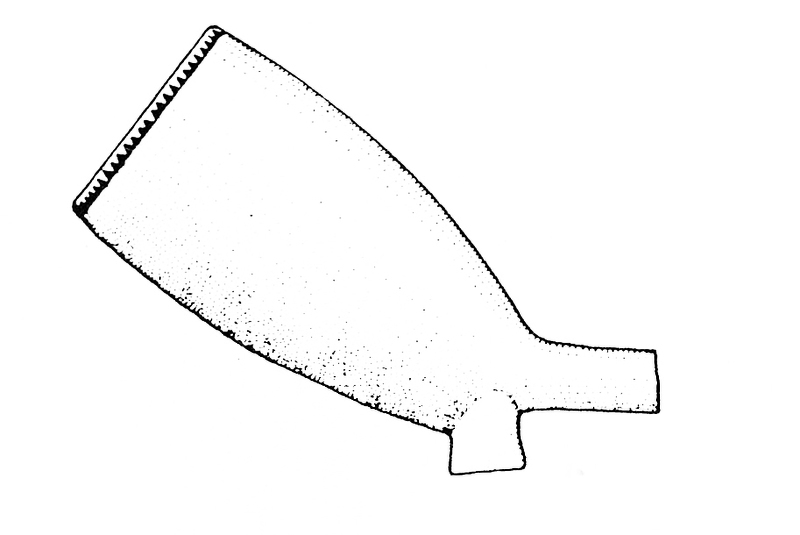 Joking aside, the Dunhill pipe book reveals some interesting insights in the early origins of conical pipe bowls with native americans who would wrap a leaf of a plant in a conical shape and stick it in a hollow tube of wood making a rudimentary Dublin shape pipe in such a way. This would appear to me to be the earliest use of a Dublin shaped pipe, although this would obviously not be referred to as a Dublin by them. Fascinating. Peterson’s design language seems to begin with a backward glance, which it incorporates and maintains while allowing for some cultural shifts in taste. BTW, there’s a shape # confirmation on this photo of an XL 88: https://www.worthpoint.com/worthopedia/peterson-shamrock-xl-88s-dublin-shape-pipe . Now if we could figure out the shape # of the oom paul that accompanied this pipe. I’ve tried searching XL 98 and XL 89, but no luck, so far. I have a 1890 – 1990 oom Paul and also an smooth Ermerald in the same shape. Brian told me, when I bought it that the bowls were from the same run. The Ermerald has no shapenumber. I looked it over with a Sherlock glass yesterday.